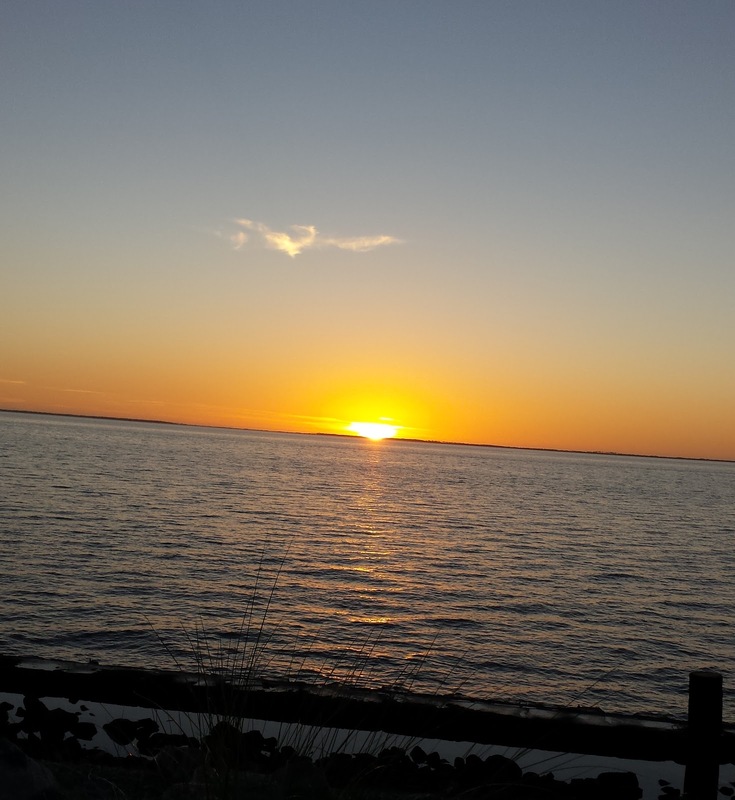 Suzy and I were truly blessed with a beautiful day on Saturday November 28 in Port Saint Joe Florida. The temps were in the seventies and there was an almost cloudless blue sky. I had the day to spend operating as Linda had to work at the CVS Pharmacy in town. 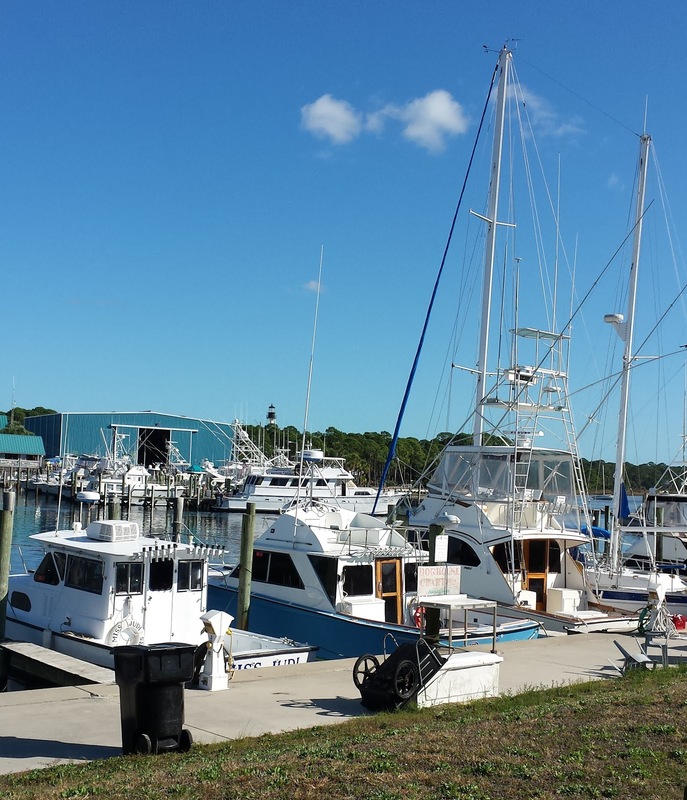 I chose Jetty Park which in on the bay at the Marina in Port St Joe. I decided to be a RaDAR field station instead of a moving station this time. I also offered to meet up with hams on a schedule. I had several takers. There was plenty of competing activities this time of year. 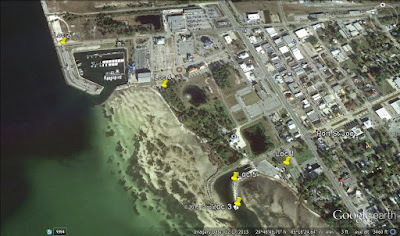 I had researched the Jetty Park site via Google maps. I wanted to take advantage of the saltwater by setting up an vertical. It almost always works out that you adjust your plan when you get on the site. I found a parking place that worked out well for Suzy, the gear and the antennas. The spot near the saltwater was seventy-five feet away over a rocky bank. I used the Chameleon Micro Hybrid with the MIL whip mounted on an umbrella stand. It was right on the sea wall. That extra coax came in handy. My first schedule was on 30 meters so I wanted an antenna to cover the low bands. I chose the Chameleon Tactical Dipole Lite. I put twenty feet of camo poles to make a mast which employed the hitch mount on the back of the truck. The two sixty foot wires stretched out nicely from there without getting in anyone's way. The Chameleon Hybrid Micro base and the MILwhip/extension on the seawall. I did not find Kelly K4UPG near Orlando. I think we were too close for 30 meters at the time. I had scheduled to work a friend Bobby AK4JA in Newnan Georgia on several bands. I worked him barely on 30 meters CW early. I missed him on 17 meters. Later in the day we worked each other on 40 meters CW and 60 meters SSB with good signals. I worked Mike KM4ELJ on 12 meters CW which was a surprise. He lives in Youngstown Florida. That is quite a distance for ground wave so not sure of the mode of propagation. One motivation for the vertical by the saltwater was to enhance the chance to work Eddie ZS6BNE in South Africa on 12 meters. Eddie could not be reached but his friend John ZS5J was there and we had a solid contact on the vertical. John had a yagi on his end. I had two contacts with John W8JER in Michigan. John and Micky will be coming South to Panama City in January. 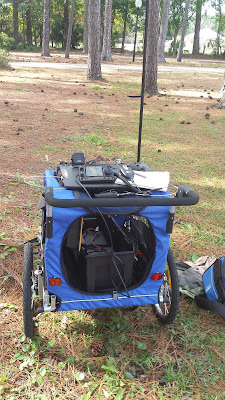 I used the Icom 7100 100 watt rig. At the end of the day I had nineteen contacts. 1 on 60 meters, 3 on 40 meters, 4 on 30 meters, 6 on 17 meters, 4 on 12 meters and 1 on 10 meters. I was avoiding the CW DX contest. 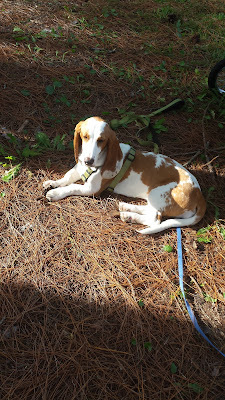 Suzy really settled in and was sunning among the rocks and greeting the visitors. She happened to find a rib bone at the picnic area. I think it was fresh from the group that just had lunch so I let her have it. It was the first real bone she ever had. She made quite a treat of it. 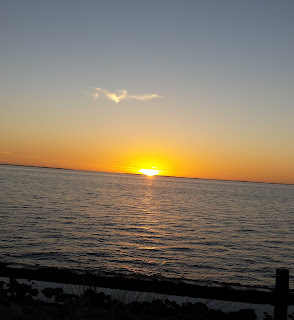 Linda and I had supper at the Sunset Restaurant so she got something out of the trip besides work. I'll be lucky to get out to operate on such a nice day this season. It was a real treat for me. The Rapid Deployment Amateur Radio (RaDAR) Challenge is sponsored by Eddie ZS6BNE. The rules are published in the SARL Contest Manual. Note, that it is no longer a contest but a challenge. The challenge is unique in that it encourages moveable stations. 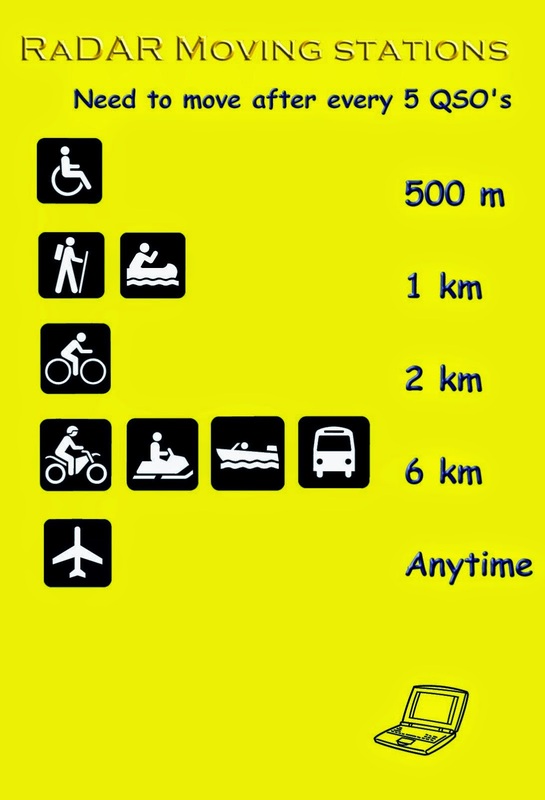 The stations move specified distance based on the mode of transportation. 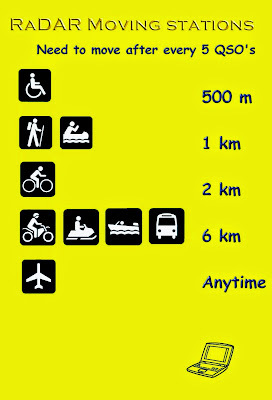 I chose to move by foot which requires a distance of one kilometer. In Northwest Florida, we have many good venues for portable and moveable stations. 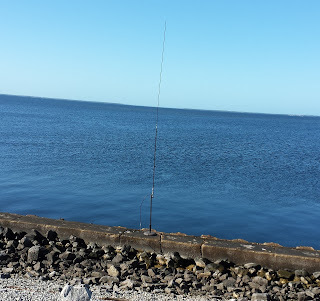 This year I picked the parks in Port Saint Joe, Florida along the Bay Trail. 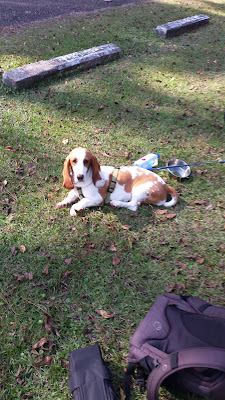 Suzy my basset puppy was my companion. 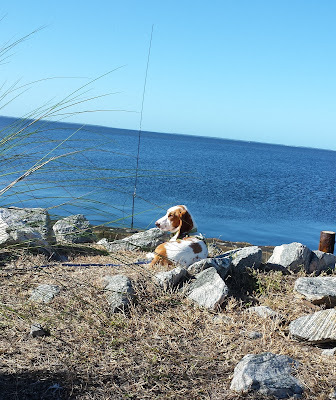 I previously have been on the beaches at St Andrews State Park, but they don't allow dogs on the beach. Certainly, moving on foot brings to mind lightweight gear and QRP power. However, I really did the opposite this time. I have a dog stroller which came about because I thought it would be an idea for Suzy. But, I found Suzy has no trouble on one kilometer hikes. Therefore, loaded my Icom 7100 with a 40 amp hour battery in the cart. 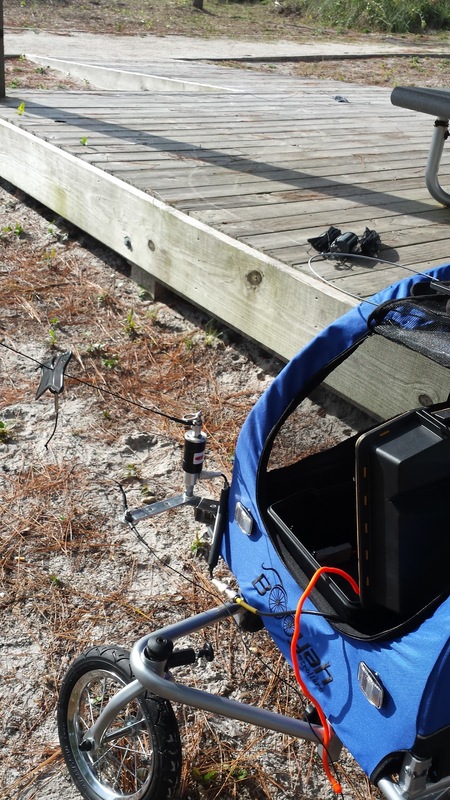 In addition the cart can anchor a Chameleon whip antenna. So during the challenge, Suzy and I setup a at five locations and made four one kilometer transitions from location to location. I will give you some notes about each location. Location 1 was at Pate Park which has some tall pines. I used the Chameleon Tactical Dipole Lite. It has two 60 foot legs. I used a pine tree to setup an inverted vee configuration. 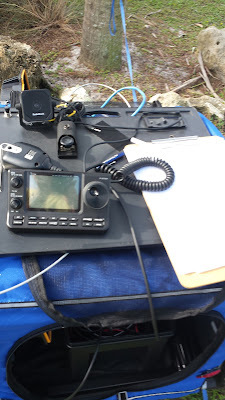 I focused on 40 meters because I get help from hams I know nearby. I worked Bob WB4BLX and Vic K4GXV on SSB and CW who were setup at the Bay County Florida EOC. 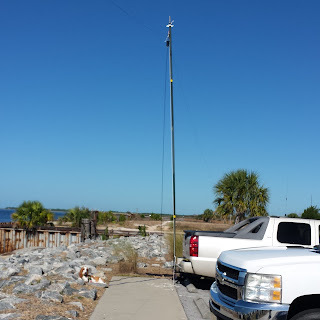 I also worked Jim K4LIX from Callaway Florida, Mike KK4ELJ from Youngstown Florida and Tom WD0HBR in Dothan, Alabama all on 40 meters CW. So having more than enough, I headed to location 2 with the cart and Suzy. Location 2 was at Jetty Park. It has no trees so I used the Chameleon Hybrid Micro and the MIL Whip/extension. 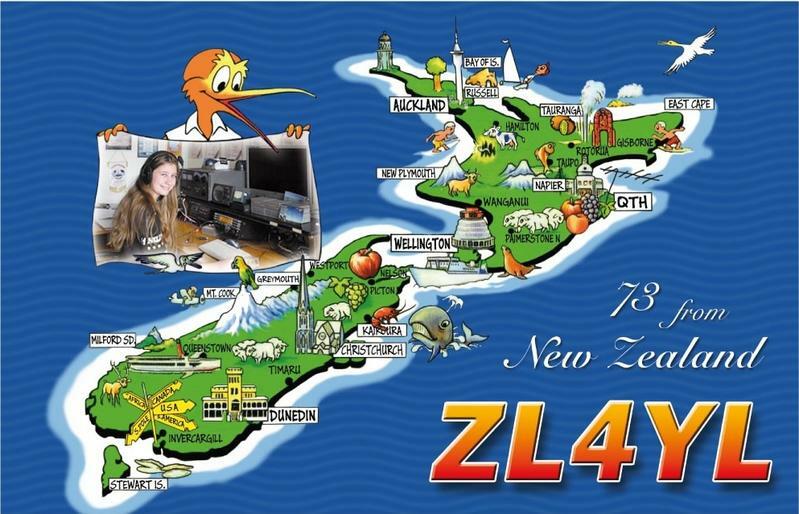 I reestablished contact with Bob WB4BLX and Vic K4GXV at the EOC on 40 meters CW SSB. Signals were very much down compared to the tactical dipole lite at location 1. I also worked Jim K4LIX. 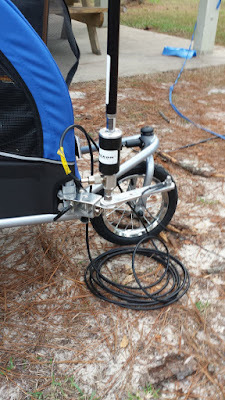 I decided to try 20 meters for fun and worked N0KOE in North Carolina CW. I got a 589 report. 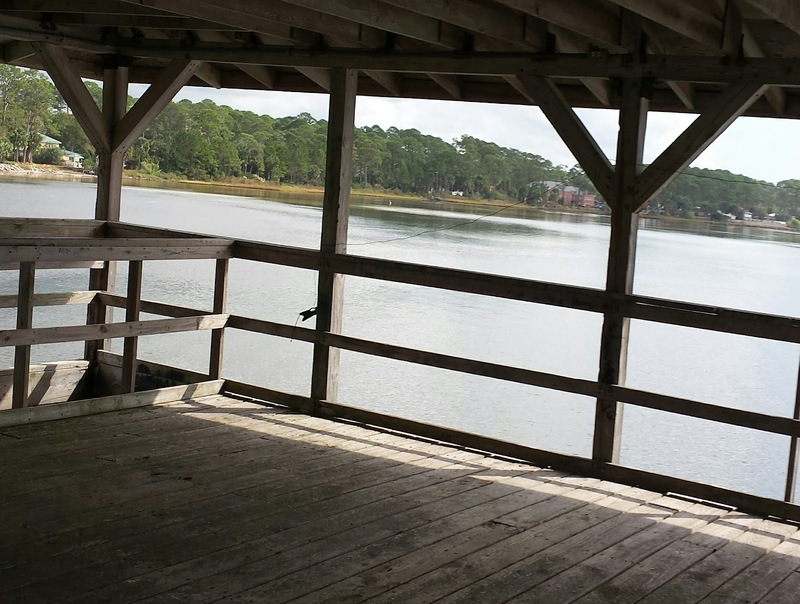 Location 3 was at a pavilion over the bay at Pate Park. 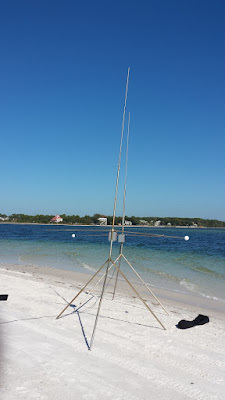 It is a different antenna challenge having a roof overhead. I ended up draping the tactical dipole along the rafters and the railings. It worked fine. I worked KC1DXD and KC1EVT on 20 meter SSB. 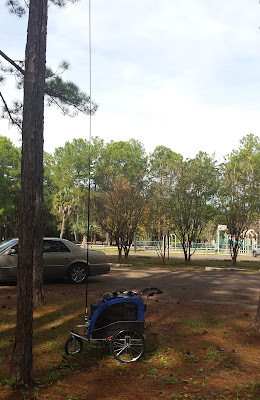 I worked WH6LE in North Carolina and KE5AL in Texas on 20 CW. They were doing the SKCC Weekend Sprint. Last was XE2JS in Chihuahua City, Mexico on 17 meters SSB. Location 4 was in the George Commerce Park area along the bay. I did some meandering in the neighborhood to get the one kilometer distance in. The Chameleon Hybrid Micro has a 60 foot wire if you are not using a whip. I used that wire as a sloper from a pine near the bay. I worked WB7T in El Paso Texas on 10 meters SSB. 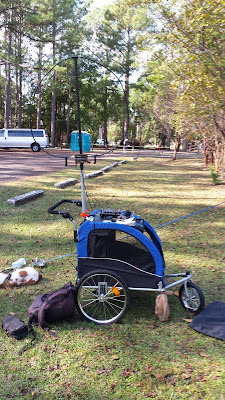 Then I had a string on 17 meters SSB including K5VWZ Texas, K4GW mobile in North Carolina, KC9PXJ in Illinois, KG5AYF in texas and W8YCM in West Virginia. Location 5 was back at Pate Park. I setup at a jetty leading out to the pavilion. At this location I had saltwater on both sides. This was a perfect place to use the Chameleon Hybrid Micro and the MIL whip. As vertical polarization can really pay off near the saltwater. It did pay off as I had a string of ten 17 meter SSB contacts to end the day. I won't list them all but they included Gordon KB2SSZ in New York who had gone out doing RaDAR earlier but was back at the shack, Happily, I worked N0OY who was doing pedestrian mobile from Kansas. 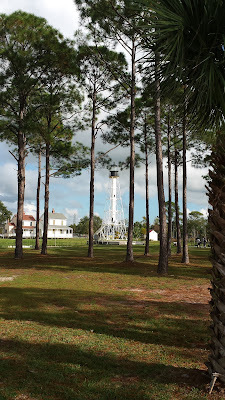 I enjoyed doing RaDAR at the Port St. Joe parks and especially Suzy's company. RaDAR is fitting your gear to the venue and your movement plan. The cart and the Chameleon Antennas fit the bill. 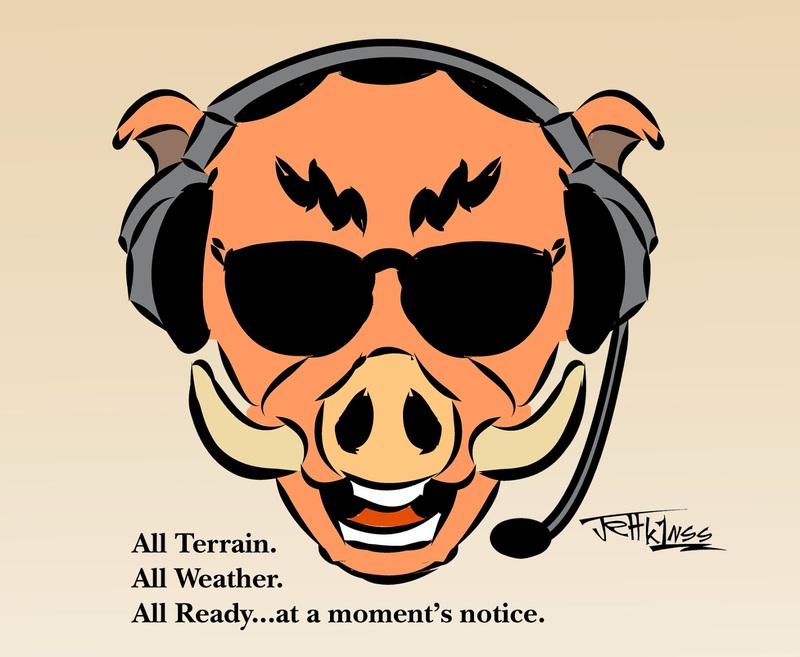 Of course the next RaDAR Challenge in April will be an opportunity for a different venue and/or different gear. My RaDAR friends including Fred VA3FAL and Tom G0SBW did not have cooperative weather. We will see who may report in at the RaDAR Community on Google+. The RaDAR Challenge is the first Saturday of April and November. November 7th is the next one. Non-moving stations are encourage to participate. However, moving stations offer an interesting challenge. The moving RaDAR station must make five contacts before moving to a new location. The distance of the move depends on the means of transportation. The venues to operate portable are unlimited. However, scenic locations make it interesting. Since you may move multiple times you may have a change of scene at each stop. Public parks are a obvious choice. You may visit move than one on your journey. My top choice for the November 7th 2015 RaDAR Challenge is the city of Port Saint Joe, Florida. The city offers a number of parks will trails in between, That is hard to beat. 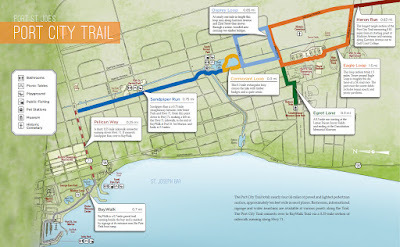 There is a combination of parks on the bay and parks inland. Antennas and how to support them is a primary concern. Which ones and how many to take? Magnetic loops, end-feds, verticals and dipoles are some of the main categories. What bands will you chose? 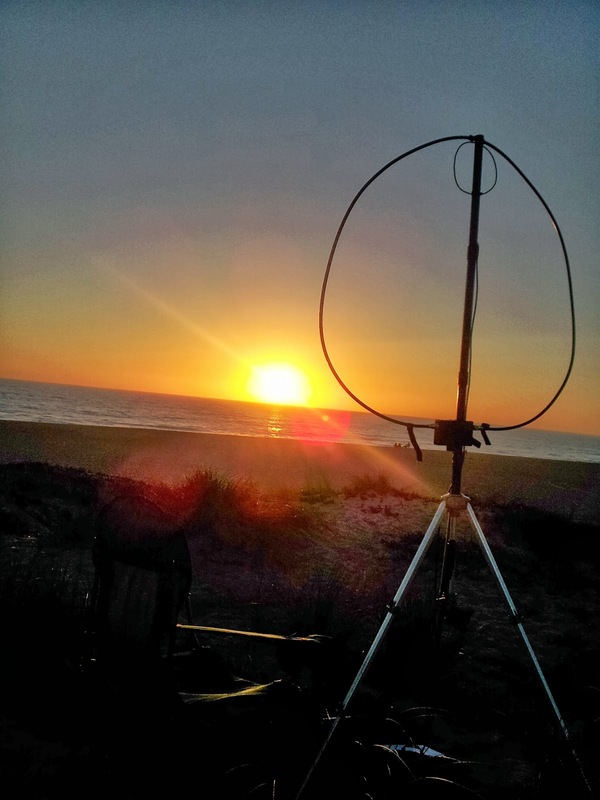 What is the state of propagation on HF? Are there other activities on the air that can help? What rig with how many bands and what power level? A few things not to overlook: You can use local hams to help. It is fair and allowed to use HF ground wave, HF NVIS or VHF/UHF simplex. You can work the same ham on different modes and at multiple stops. There may be other RaDAR ops operating in your area. Oh yes, you will need to know your Grid Square to at least six digits. I use a Ham GPS app on my Android. (As may be confirmed by the extensive information exchange). Eddie Leighton ZS6BNE is the originator of the Rapid Deployment Amateur Radio Concept (RaDAR). He has evolved the event from a contest to a challenge. The score is useful to compare your current challenge with your past challenge outings. It is not to determine a winner. You have a full 24 hour window to participate. Good luck to all who will take on the challenge. Any outing that day is a start. Or just chase us RaDAR ops! 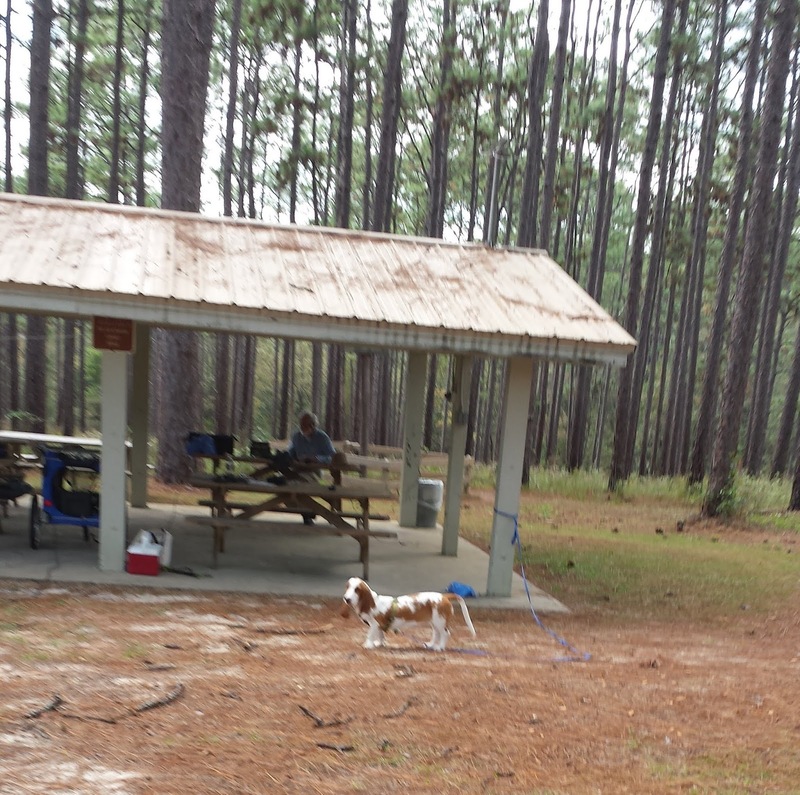 Falling Waters State Park is near Chipley, Florida. 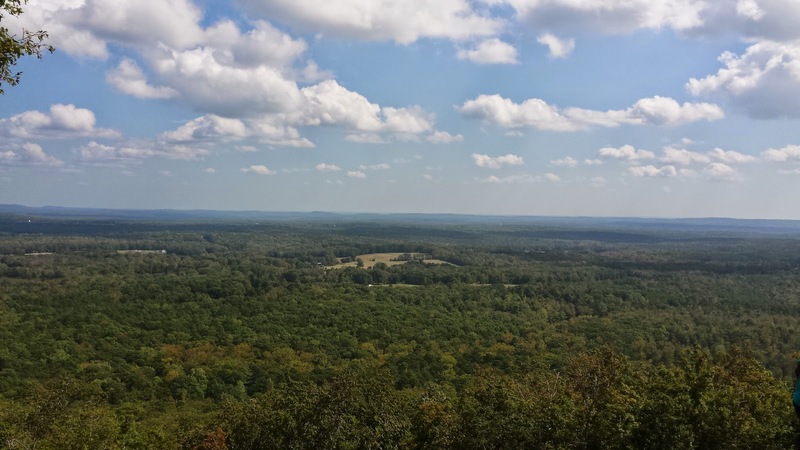 Of course, you may not have heard of Chipley. 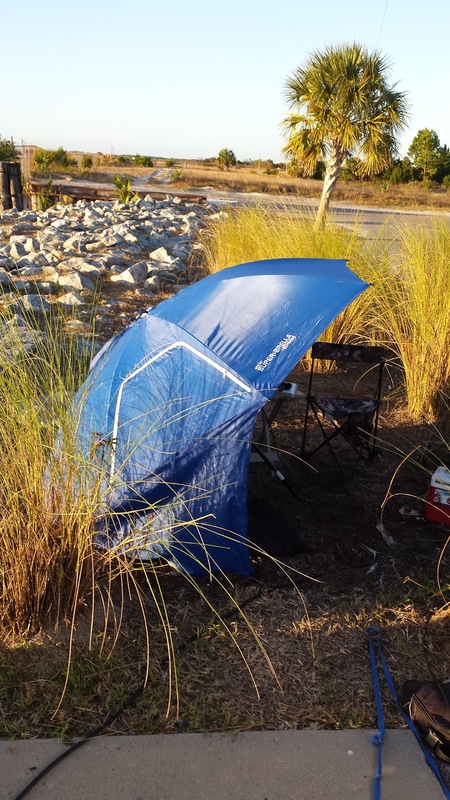 It is about 45 miles North of Panama City on Interstate I-10. There were two things going on. First, Tom WD0HBR and his wife Sandy were a "maybe" to arrive from Dothan. The second was I have attained a dog stroller. 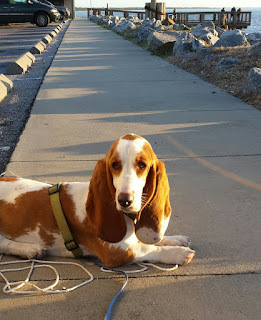 I had the stroller in mind for Suzy to go with me when I do RaDAR on-foot transitions, But that was a miscalculation, since I have learned Suzy enjoys those transitions of one kilometer and leads the way. Therefore, I thought I would test out the stroller to transport my radio gear. Indeed it will hold my Icom 7100 portable box and as a bonus it will support the Chameleon Hybrid-Micro Whip antenna. The dog stroller with a radio box inside instead of a dog. It turned out Suzy did her own solo transition early. 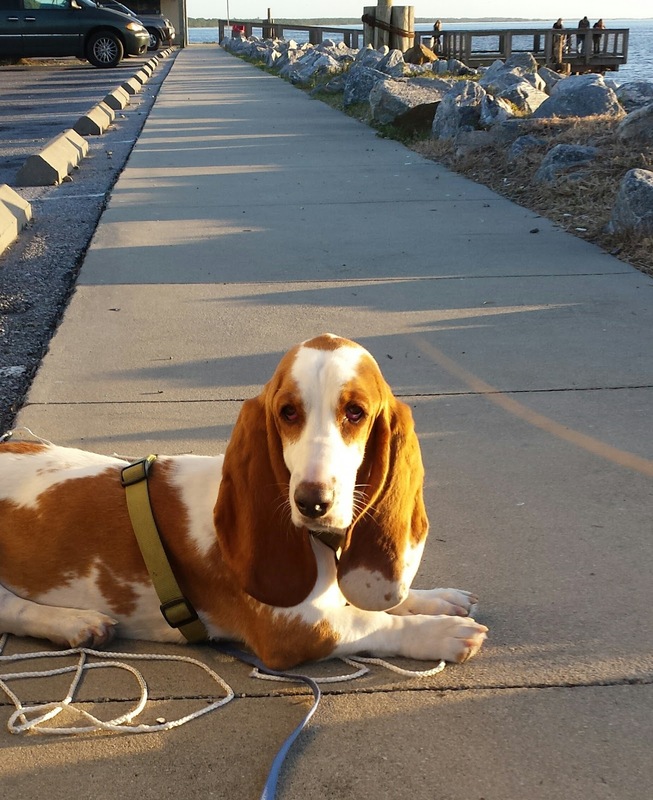 I had tied her with a long leash while I was setting up a a pavilion. There was an empty metal trash can there. Suzy tipped it over and there was a loud crash. Then Suzy panicked and wanted to get away from the can. She got entangled among the picnic tables and slipped out of her harness. Then she was off running full speed up the road. She was not at all interested in stopping. Some park volunteers in a golf cart helped turn her around. It took her a while for her to feel comfortable at the pavilion again but she eventually did. The next happening was Tom WD0HBR and his wife Sandy did arrive, Sandy is a ham too but she setup to do lace work while Tom and I operated radios. 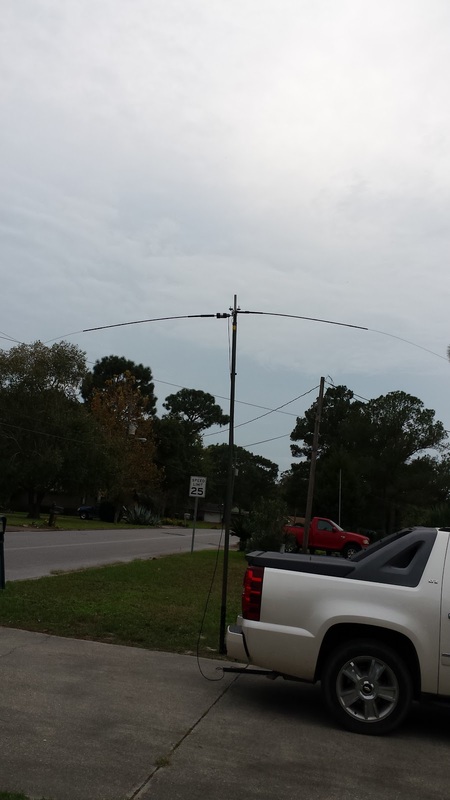 Tom gets amazing results from his MFJ 9040 5 watt rig and about 50 feet of wire. It turned out the best he could do was to run the wire horizontal about seven feet off the ground to a nearby pine tree. 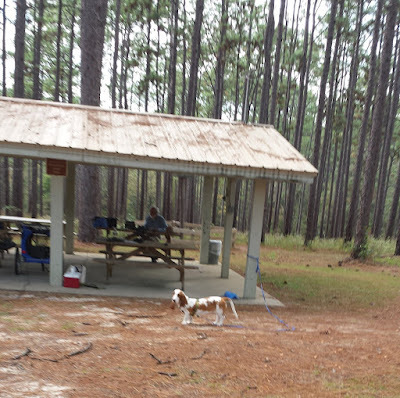 Tom worked a SOTA station in North Carolina and later a second NC station. 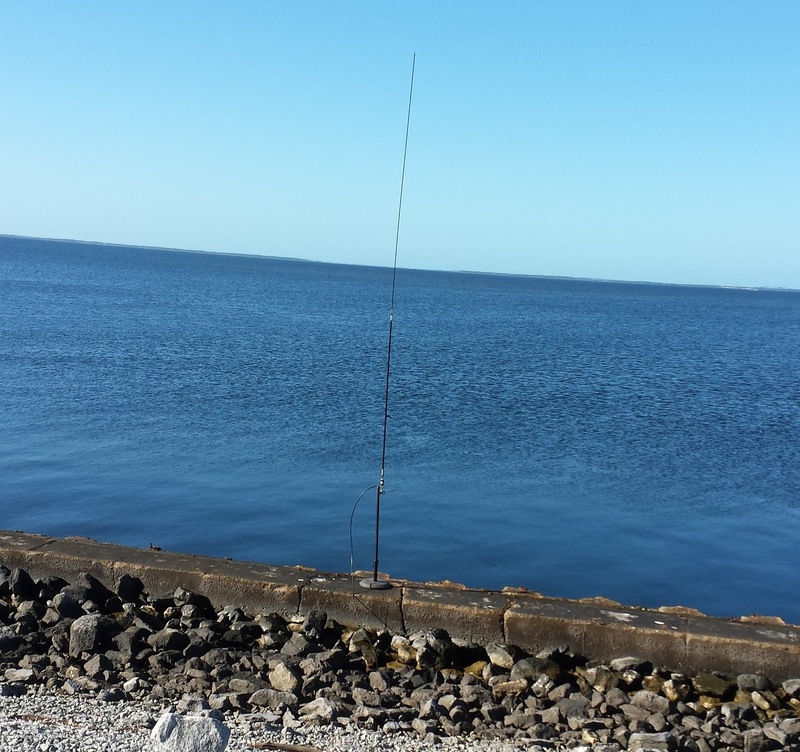 His last QSO was with a Panama City ham Mike K4MTI. I had not heard Mike on the air in a while and both Tom and I worked him. I had the Icom 7100 box with battery in the dog stroller. At first, I hooked it to a Chameleon Tactical Dipole Lite. supported by a low limb Due to power lines, I dropped most of one end on the ground. I started on 40 Meters CW and worked K4KHV in nearby Marianna, Florida. 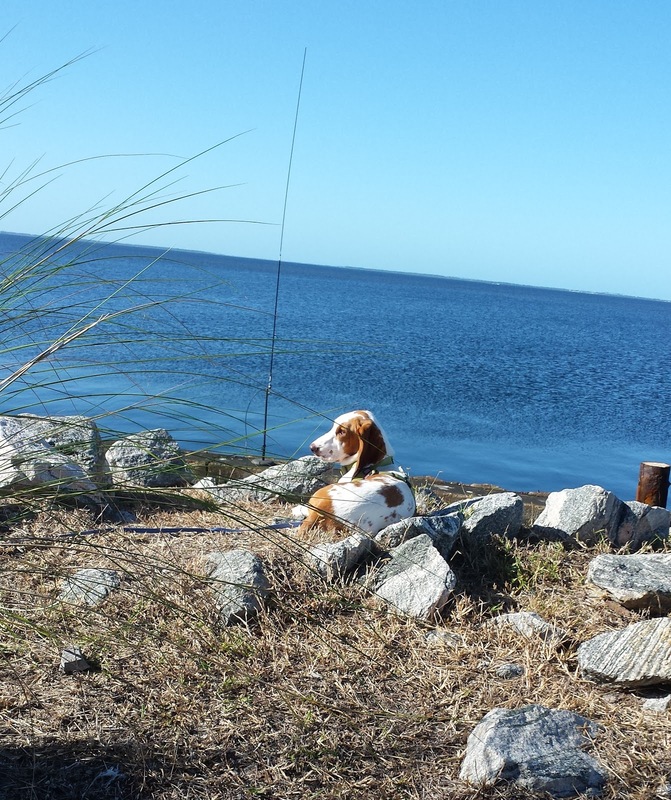 I later worked him on 40 meter SSB. The same for Mike KM4ELJ from Panama City. I also worked Bob WB4BLX on SSB in Panama City. He was out portable. 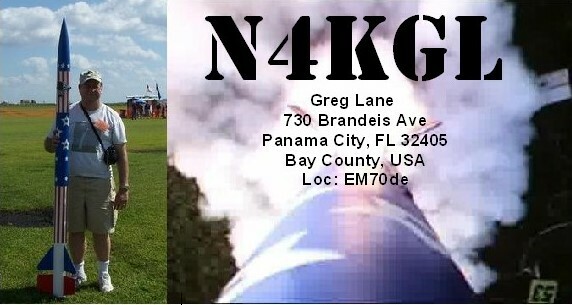 I also ran into KE4QEG in Panama City on the 2 meter repeater. He met me on 40 SSB. 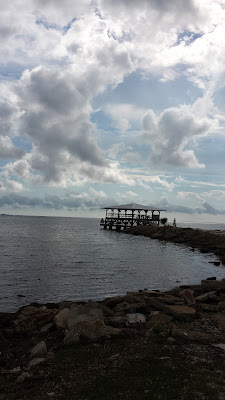 I heard Jack N1HQ of Panama City who was visiting in Silver Springs Florida. He could not hear me. 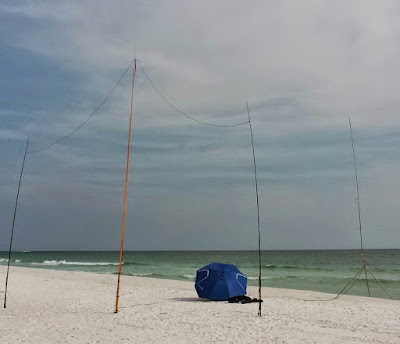 I moved on to other bands and for the day had a contacts on 40, 30, 20, 17, 12 and 10 meters. 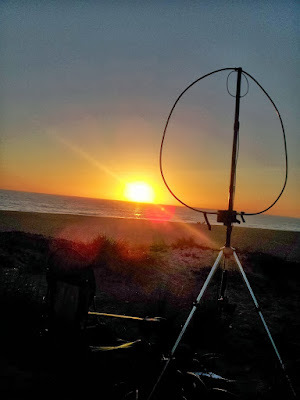 It was nice to that the the high bands were open.The 12 meter SSB contact was with John MW1CFN in Wales. Note, I had repositioned the Tactical Dipole leg that was on the ground to a tree. 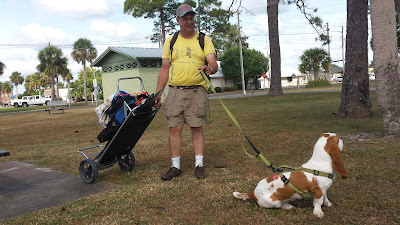 I did some practice motoring around with the dog stroller with Suzy. I am not trying to operate while in motion. 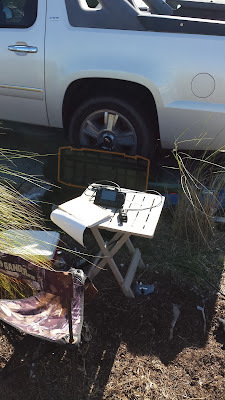 I had some issues with RF affecting the rig, I found that moving the 7100 head out to a portable table solved that. I think that a useful thing for the cart is it supports the Hybrid-Micro and the whip. With that configuration, I worked WP4OUH in Puerto Rico on 10 meters SSB. Also surprising I was getting excellent reports from WB4DBO in Huntsville Alabama on 30 meters CW. 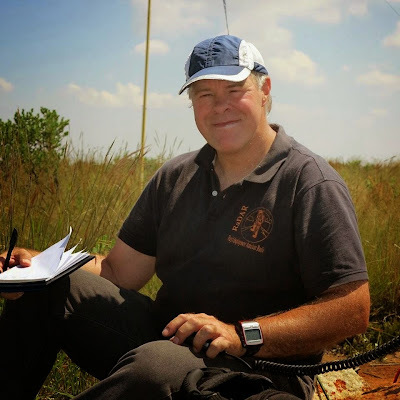 I also worked Mike K4MTI on 40 meters CW. These contacts were with the MIL whip/whip extension about 18 feet long. Then for fun I tried the whip about seven feet long and the Chameleon top hat. I worked Igor W0O in Frankenstein, Missouri on 20 CW. Now that was sweet since it was Halloween. 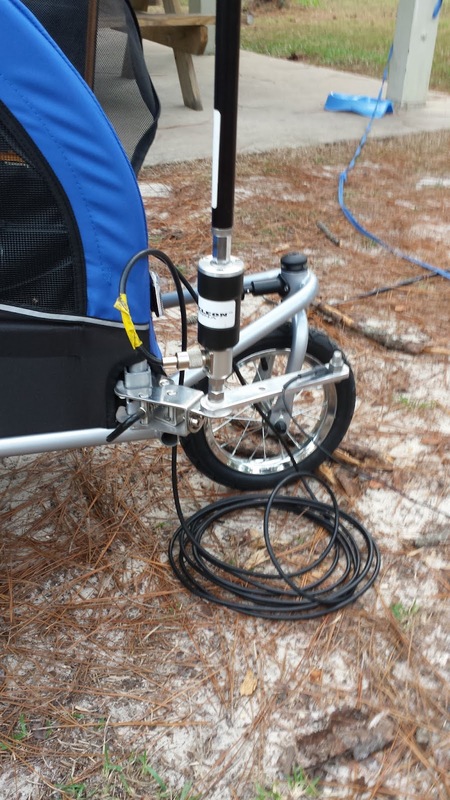 The attachment of the Chameleon Hybrid-Micro to the stroller with the claw mount. Tom and Sandy went on the trail to the falls. It was just a trickle due to the dry weather. However, Tom, Sandy, Suzy and I had a great day at the park with comfortable weather.